"The secret of the Great Pyramid, the sole survivor of the Seven Wonders of the World, has fascinated people throughout time. Countless theories exist as to how it was built, but none stands up to analysis. In 1999, Houdin had an insight and decided to devote himself to developing his theory. Eight years of passion and research ensued, whereby he imagined the construction site of Kheops as the first industrial construction site in history. To further refine and test his theory, he called on Dassault Systemes to help. As part of its 'Passion for Innovation' sponsorship programme, DS decided to help Houdin solve the 4,500-year-old mystery with its real-time 3D solutions." Bob Brier will apparently be accompanying Houdin to the site for field work. See the above page for the entire press release from Dassault Systemes. "Workers at the N.C. Museum of Art this morning began unpacking objects on loan from the British Museum for its first major exhibition of Egyptian art, which will open April 15. A crew spent about an hour removing a 6,000-pound granite lion from its crate and, using heavy-duty rigging, painstakingly installed it in the lower-level gallery. The sculpture was one of two commissioned by Pharaoh Amenhotep III, who ruled from 1390 to 1352 B.C., to decorate his temple in Sudan. . . . The exhibition will be organized into four themes: the lives of artists and nobles, the king and the temple, statues and burial objects. Some of the objects are as old as 3,000 years, and include sculpture, jewelry, cosmetic tools and funeral items. The objects are part of the permanent collection at the British Museum, and constitute one of the most significant repositories of historical Egyptian items outside of Cairo." "The Merowe dam is a controversial hydroelectric project one of the largest in Africa being erected on the Nile's fourth cataract and due to start flooding the valley over more than 100 miles within months. Archaeologists admit that an incalculable amount of information will be forever lost. But the largest archaeological rescue project since the Nubian campaign began in the 1960s (during the construction of the Aswan dam in southern Egypt) has unearthed a heritage that would likely have remained untapped." "Chairman of Egypt's Supreme Council of Antiquities (SCA) Zahi Hawwas opens on Wednesday 28/3/2007 the proceedings of the third forum on Islamic and Coptic antiquities at the SCA headquarters in Cairo. Hawwas will announce during the two-day gathering ancient finds discovered by missions in some sites in Qena, the Red Sea, Damietta and Sinai. Archaeologist Hisham el-Leithi, the rapporteur of the forum, said 16 new researches will be shown on the excavation and restoration operations in Islamic and Coptic sites." See the above site for more details. Associate provost and director of core curriculum in the American University in Cairo (AUC) John Swanson, mocked the Hollywood portrayal of Ancient Egypt, during a talk he gave Wednesday night at AUC. . . . He explained that Hollywood movies during the 50s and 70s only showed interest in Ancient Egypt, or the Egypt of the Pharaohs. Directors became fixated with only one period of time that existed 2,000 years ago. The movies show that Egypt ceases to exist beyond that period, and also show stereotypical plots that are 'divorced of anything that has to do with Modern Egypt,' said Swanson." Terry Deary, the world's best-selling non-fiction author for children, has delighted readers across the globe with his lively accounts of history.Now two of his books have been adapted for the stage by the Birmingham Stage Company and look set to be a huge success with youngsters and adults alike. . . . In Awful Egyptians, audiences will learn the truth of Tutankhamen and his creepy curse and find out the fearsome facts about 'phabulous' pharaohs, mean mummies and ghastly grave robbers. See how the Egyptians really lived 5000 years ago; how dead bodies were turned into mummies, how the huge pyramids were built and why some Egyptian kings had to wear false beards! Dare you enter through the Gates of the Afterlife? Beware the Evil Eye of Horus which has its eye on you." "It was one of the seven wonders of the ancient world, and the only one of them to remain standing today. Yet the story of how the Great Pyramid of Giza was actually built has remained a mystery for more than four millennia - until, perhaps, now. A French architect believes he has finally solved one of the most puzzling construction problems in history by working out how the ancient Egyptians built such a massive structure without the benefit of iron tools, pulleys or wheels. In Paris tomorrow, Jean-Pierre Houdin will unveil the fruits of eight years' work by describing at a conference how the pyramid of the pharaoh Khufu was built from the inside out. He will propose that the Egyptians carried the building blocks up an internal ramp that formed a spiral tunnel within the structure's outer wall. These tunnels, he believes, must still exist today. With the help of sophisticated computer software developed by the French company Dassault Systemes, M. Houdin has been able to reconstruct a three-dimensional simulation of how the great limestone and granite blocks of the pyramid were put together stone by stone." See the above page for the full story, which includes full details of how Houdin thinks that the construction was carried out, plus a summary of the most popular previous theories. Nevine El-Aref writes about the lastest discoveries from the tomb of Djehuty: "The discovery in 2003 of the tomb of Djehuty, overseer of works at Thebes during Queen Hatshepsut's reign, amazed Egyptologists and historians not only because of its distinguished and uncommon architectural design and decorative scenes, but also for the artefacts found within its corridors -- objects from different dynasties piled in the tomb to form a haphazard treasury. These finds, made at Draa Abul-Nagaa on Luxor's west bank by a Spanish-Egyptian archaeological team, revealed more details about an unusual time in Egypt's ancient history. This week after six consecutive concessions, the mission has unearthed instruments used at the funeral inside the tomb that add emphasis to the importance of Djehuty's position. While cleaning the debris in the tomb's open courtyard archaeologists found a 70cm-deep pit containing 42 clay vases and 42 flower bouquets." See the above story for details, and a photograph of the floral remains. The main site is in Spanish, but there are English and Arabic pages on it as well, which can be accessed by clicking on the flag, top left. The English pages include an image gallery from the 2006 season. "If any ancient Egyptian spirits are still with us, then they were gathered at the Cairo Opera House last week when Egyptologists met to celebrate their first official day of tribute. The grand theatre became a temple for the day, embellished with a noble façade, columns and statues of ancient Egyptian Pharaohs and deities. The stage had a special backdrop featuring animated ancient Egyptian workmen carving the title of the gathering: 'The First Day of Archaeologists' on a limestone wall. Strains of classical music filled the theatre hall as foreign and Egyptian archaeologists were welcomed by Zahi Hawass, secretary-general of the Supreme Council of Antiquities (SCA). From next year on the day will be held annually on 14 January. This is the date when, in 1953, the Egyptian Antiquities Authority (EAA) became an Egyptian-run organisation headed by Mustafa Amer, the first Egyptian archaeologist to oversee Egypt's antiquities." There is a list of the archaeologists honoured, with a description of the contribution made by each of them. They are: Abdel-Hamid Zayed, Abdel-Rahman Abdel-Tawwab and Ahmed Abdel-Hamid Youssef as well as four deceased archaeologists: Ahmed Pasha Kamal, Selim Pasha Hassan, Mustafa Amer and restorer Ahmed Youssef. "Hawass took procedures to check on the ducks. Careful checking of the ducks against Arnold's excavation notes and the information recorded in the Saqqara magazine registers confirmed the identification of those as Christie's and Wace ducks. An inventory of the Saqqara magazines showed that they were indeed missing, along with a number of other items. When apprised of the situation, Christie's immediately removed the first duck from auction list and turned it over to the United States Department of Homeland Security. It will be returned to Egypt next week." A nice photo of one of the ducks is also shown on the above page. "Egypt sent an archaeological team to France today to retrieve 3200-year-old strands of hair from the mummy of Pharaoh Ramses II, who presided over an era of great military expansion in Egypt, state media said. The existence of the hair came to light last year when some of the strands were offered for sale on the internet for between 2000 and 2500 euros ($3800 and $4760), in addition to tiny pieces of resin and embalmed cloth taken from the mummy." A story about the sailing of replica shipwrecks in Turkey. The relevance is that one of the ships, the Uluburun, originally carried a seal thought to belong to Nefertiti: "The 360 Degree Research Group, which had built the replica of the oldest known shipwreck, Uluburun II, is now getting ready to initiate a new project anticipating a voyage from Phokaia (modern Foça) to the Marseille via two replica ancient ships. . . . A replica of the oldest known shipwreck, Uluburun II, was built by the 360 Degree Historical Research Association in Urla, İzmir and displayed in Bodrum as part of activities marking the 80th anniversary of Sabotage Day in July. Considered to be one of the most significant archaeological finds of the 20th century, the 3,300-year-old Uluburun took its place in history as the oldest commercial vessel while the artifacts - including a 3,300-year-old seal believed to belong to Egyptian Queen Nefertiti, a huge amphora and jewelry - excavated from the shipwreck excited science and archeology circles." Jane Akshar has updated her blog with an account, accompanied by lots of pictures, of her boat trip to the Speos of Horemheb at Gebel Silsila, which looks marvellous. See the above page for full details: "The speos of Horemheb is a rock cut chapel in the side of the mountain, t shaped with the top of the T facing the river. It has 5 openings and all wall surfaces are decorated. The end of the down stroke of the T has statues of Amun and five other Gods at the end and according to the guardian it gets lit up by the sun, similar to Abu Simbel, at certain dates in the year." See the above for the full story and the great photos. Lovely to have you back, Jane! Zahi Hawass reflects on his life, his recent eye operation and some dental work he had whilst in Miami. Nothing much about Egyptology, but might be of interest to Hawass enthusiasts. It is nice to have a really good survey of an area online, from time to time, and this is one such article on the Smithsonian website. The five-page article takes the reader through a complete summary of Alexandria's archaeology and history, tells the story of how ancient Alexandria has been rediscovered and recovered, describes some of the individual discoveries and discusses some of the theories as to why much of ancient Alexandria is now under water. It is nicely written in a journalistic, rather than academic style and it paints a very lively picture of the present meeting the past both underwater and on dry land. It is accompanied by a lovely underwater photograph of a diver face to face with a sphinx. I found that each page took a while to load, but they emerged eventually. "Empereur and other scientists are now uncovering astonishing artifacts and rediscovering the architectural sublimity, economic muscle and intellectual dominance of an urban center that ranked second only to ancient Rome. What may be the world's oldest surviving university complex has come to light, along with one of the Seven Wonders of the World, the Pharos, the 440-foot-high lighthouse that guided ships safely into the Great Harbour for nearly two millennia. And researchers in wet suits probing the harbor floor are mapping the old quays and the fabled royal quarter, including, just possibly, the palace of that most beguiling of all Alexandrians, Cleopatra. The discoveries are transforming vague legends about Alexandria into proof of its profound influence on the ancient world." To accompany the above article there is an interview with one the author, Andrew Lawler: "The city felt inhabited by so many layers, so many ghosts from so many eras, and yet was also a thoroughly modern Egyptian city. So it was an unusual combination of past, present and future. It's all very rich. I spent a lot of time simply walking the streets, walking around without focusing too much on maps or guidebooks, just wandering because I know in Forster's book he and others have talked about the value of simply wandering the streets of Alexandria. You can really get a feel for the different kinds of architecture and the different eras." See the above page for the interview. Finally, the Smithsonian have rounded off their Alexandria theme with the question "Who Was Cleopatra?". The two page article looks some of the myths and tries to dig into some details of what was acutally known about Cleopatra VII: "What kind of pharaoh was Cleopatra? The few remaining contemporary Egyptian sources suggest that she was very popular among her own people. Egypt's Alexandria-based rulers, including Cleopatra, were ethnically Greek, descended from Alexander the Great's general Ptolemy I Soter. They would have spoken Greek and observed Greek customs, separating themselves from the ethnically Egyptian majority. But unlike her forebears, Cleopatra actually bothered to learn the Egyptian language. For Egyptian audiences, she commissioned portraits of herself in the traditional Egyptian style. In one papyrus dated to 35 B.C. Cleopatra is called Philopatris, "she who loves her country." By identifying herself as a truly Egyptian pharaoh, Cleopatra used patriotism to cement her position. Cleopatra's foreign policy goal, in addition to preserving her personal power, was to maintain Egypt's independence from the rapidly expanding Roman Empire. By trading with Eastern nations—Arabia and possibly as far away as India—she built up Egypt's economy, bolstering her country's status as a world power. " Travel article looking at some of the sites on Luxor's West Bank: "Hidden between enormous limestone cliffs in the Valley of Kings was Tuthmosis III’s tomb, reached by a steep staircase. he was the first king to build his tomb in the valley and to keep it secret, the sarcophagus was put in a most inaccessible spot, via narrow, low claustrophobic passages going up and down. Even then graverobbers got to him. Now the chambers are lit and equipped with ventilators and air pumps but we wore masks as our breaths would affect the drawings — which were indeed magnificent. Superb heiroglyphics and colours depicted scenes of a night sky, offerings to gods, daily chores during afterlife". A bit of a stretch on the relevance front, but it might be of interest to anyone interested in north east African prehistoric climate: Researchers at the Boston University Center for Remote Sensing used recently acquired topographic data from satellites to reveal a now dry, ancient mega-lake in the Darfur province of northwestern Sudan. Drs. Eman Ghoneim and Farouk El-Baz made the finding while investigating Landsat images and Radarsat data. Radar waves are able to penetrate the fine-grained sand cover in the hot and dry eastern Sahara to reveal buried features. . . . As proven by El-Baz in Egypt, just north of Darfur, former lakes in this part of the Sahara are underlain by vast amounts of groundwater. His earlier detection of the 'East Uweinat' basin in southwestern Egypt – where the groundwater rises to 25 meters below the surface – resulted in the drilling of 500 wells to irrigate 100,000 acres of agricultural land." A paper detailing the discovery will be published in an upcoming issue of the International Journal of Remote Sensing. This story has been floating around the Internet for a couple of weeks now, but this is the most comprehensive coverage I have seen of it. Basically, the decision by the Louvre to charge Abu Dhabi a hefty sum for the use of its name and some of its collections has created more than a bit of a stir. It is of general interest, but there is also a paragraph within this that refers to the attempts by Egypt and other countries to repatriate various artefacts (including the Dendera Zodiac), and looks at the significance of so-called "national" collections: "Much of the opposition to the proposed Abu Dhabi Lourve lament that the French public will be deprived of its heritage. Three out of eight of the departments that structure the Louvre collection contain art from the Middle East and North Africa and are categorized as such: 'Near Eastern Antiquities,' 'Egyptian Antiquities' and 'Islamic Art.' If this latest transaction with Abu Dhabi does in fact indicate a move to exploit France’s patrimony, then it must be acknowledged that the 'French culture' being disputed over is not purely French nor is it devoid of a ruthless colonial history. In theory then, according to French opinion, it is perfectly acceptable to exploit non-French peoples and cultures for economic gain, whereas everything French is somehow sacrosanct and must be guarded from the tentacles of globalization." A piece looking at conservation work at the Hermitation Foundation Museum in Norfolk, U.K.: "In 2006, they repaired an Egyptian falcon sarcophagus from 664 B.C., which was adopted by Tom and Arlene Baragona. The small, narrow box is topped with a statue rendering of the Egyptian god, Horus, with a falcon head and a human body. Inside was once the body of an un-mummified falcon. The box, with a small hole in a corner and patches of light green-blue on the otherwise bluish-black surface, does not look perfect, which is surprising to someone unfamiliar with art conservation. Amy Byrne explained by e-mail that the Hermitage decided to focus on repairing 'Aactive corrosion.' "
A somewhat tenuous link to ancient Egypt, but it's a slow news day: "It‘s a rare chance to smell the scent of ancient history — typically a mix of natural spices and olive oil — thanks to an exhibit in Rome featuring fragrances from the world‘s oldest known perfume factory. . . . While perfumes and ointments have been found in tombs in Egypt and Mesopotamia, Belgiorno said this was a rare case where an entire factory dedicated to making perfume was found." The blog and I share a birthday. I started the blog, for reasons unknown, on my 40th birthday and have been doing it ever since. So Happy Birthday to my blog, and to anyone who shares a birthday with us! The KV-63 website has been updated with donor information and news about the new season: "At this time our proposal and security papers are in the hands of the Supreme Council of Antiquities (SCA). As soon as the SCA issues its rulings we will update everyone on our plans, progress and travel itineraries. Many thanks for your patience and support. Please check this site frequently for updated donor information.In April, many of the KV-63 staff members will be at the ARCE Annual Meeting in Toledo, we hope to see some of you there." "Egypt has succeeded in retrieving two food alabaster boxes in the shape of ducks which had been excavated by Dr. Dieter Arnold in 1979 from the pyramid complex of Amenemhat III at Dahshur then smuggled abroad. These were reconstructed, then taken immediately to the magazines at Saqqara and stored there, Culture Minister Farouk Hosni announced Sunday. Secretary General of Egypt's Supreme Council of Antiquities (SCA) Zahi Hawass explained that such boxes returned back to Egypt with the help of Arnold who is now a senior curator at the Metropolitan Museum in New York. Hawass continued that several years ago, the Metropolitan Museum of Art in New York and the other from Rupert Wace Ancient Art Limited in London. Arnold was intrigued by these ducks, as he knew they must be royal, but the Metropolitan Museum was not satisfied with their provenances and decided against buying them. However, he and his assistant, Adela Oppenheim, continued to study photographs of these ducks and realised that they were, in fact, the same ducks that Arnold has excavated in 1979. Arnold informed Hawass immediately of this situation." Jumping on the band wagon of holiday jottings, I thought I'd offer some thoughts about travel in Aswan and Lake Nasser on slow news days(Aswan today, and Lake Nasser when I get my act together). There are plenty of "what it was like" articles floating around the Internet and covered on this blog, so I thought I'd avoid describing all the glories of each site (multitudinous though they are) and, instead, talk about some of the less exciting but still useful things you might like to know if you're contemplating a trip to the area. You can click on thumbnails to see the bigger image. Firstly, my thanks to our guide Mahmoud Abd El Mola for his expertise and practical advice. He was one of the best tour guides I've met in all my visits to Egypt. Getting to Aswan turned out to be fun and games. Direct flights to Aswan from overseas have been suspended, so you have to fly into Luxor and take a coach or train. The coach trip took four hours (we were told three). As the check in time was three hours before the flight, and the flight was over five hours long, this made for a very long day - even longer on the reverse leg of the trip, because the plane was an hour late leaving. It is very tiring. It is something to consider when you are thinking of a trip to Aswan. Aswan is now big. Visiting again Aswan after nearly 10 years was an amazing eye opener, and not quite what I remembered. It has grown considerably, with new buildings (domestic, industrial, civic, military) still going up at a staggering rate. It seemed unlikely that the cause of all this growth could be tourism alone, so we asked Mahmoud, who gave us a list of the economic activities in the immediate vicinity. This included two sugar refineries, a steel works, a Coca Cola factory and a fertilizer plant serving the entire of Upper Egypt - the second major plant is at Alexandria and serves Lower Egypt. Fertilizer is now a necessity in Egypt, due to the build up of the fertile African silt behind the Aswan dam. There is also granite quarrying and the maintenance of the hydroelectric plants and turbines of the two Aswan dams, plus fishing, with a canning plant near Kalabsha. Tourism is obviously a contributing factor, with numerous hotels and restaurants, an endless stream of cruise boats and the management of archaeological monuments. The main town itself is an odd mixture. The Nile-side Corniche (the road that borders the Nile) has good views over the river with its islands and constant flow of feluccas and decorative motor boats, and the constant pestering to take boat rides is not as insistent as that of Luxor - but it is still wearing, even with the necessary Egyptian Arabic to be firmly but politely negative. The buildings that front the Corniche are mainly banks and hotels with apartments above, and are neither attractive nor particularly interesting - and most are really quite ugly. Go beyond the corniche, and there are some interesting side roads, but until you reach the bits where tourists don't venture (and are therefore not a target) prepare to be nagged for attention. Aswan does have a more cosmopolitan air about it than some Egyptian towns, and has a very friendly and welcoming atmosphere that is instantly endearing. I'm not sure how it achieves this, but it does! Looking at the residents of Aswan, one of the big changes in the last ten years, consistent with what I have seen elsewhere in Egypt, is that Egyptian women nearly all wear Islamic headscarves. There was a period in Egypt when women abandoned their headscarves as a significant gesture of independence, but this has clearly been reversed wholescale. Farouk Hosni was put under pressure to resign when he suggested that this was "regressive", but he is clearly losing the battle, if recent visits to Egypt are anything to go by (to see coverage of this issue, see the BBC website at: http://news.bbc.co.uk/1/hi/world/africa/6169170.stm. Having that, one of the other surprises is how many young Egyptians, women included, are clothed in western type clothes. Although many of the men are still wearing traditional galabeyas, most of the student age men, and some young women. are wearing branded trainers, jeans, and t-shirts. There are far fewer women dressed in the full hijab that covers both the face and the contours of the body, than I have seen elswhere - for example, in Cairo. Aswan is at the First Cataract. For those of you who know very little about the area, the First Cataract is a series of granite islands and beds, which form rapids and waterfalls and is now impassable due to the creation of the Aswan High Dam. Before the dam, the annual floods used to cascade over the rocks and at these times the river was navigable by expert pilots. Aswan is the site of the ancient Egyptian city Syene, which was actually based on the defensible island of Elephantine over a 2km square area. Today the ruins of Syene include the famous Nileometer, several temples and a number of hieroglyphic inscriptions on granite outcrops. Views across the Nile and visits to the west bank are spectacular, with small boats everywhere day and night. The sceneary is wonderful. A number of restaurants outside the hotels were recommended, some of which have their own ferry boats to take you to their island locations. There is the fish restaurant called Khalim, near the railway station at the far northern end of Aswan, and the Nubian Restaurant which has its own ferry opposite the Egypt Air office at the far south of Aswan, under the Coptic Cathedral. There's no MacDonalds just yet, but apparently plans are afoot after the success of the one in Luxor. The Old Cataract's restaurant is good, but needs booking in advance. If you want to use a bank, the opening times should be investigated. They are open in the morning and evening, but not in the afternoon. The one at the New Cataract Hotel opens at 7pm. It is also worth noting that the bank at the New Cataract (can't for the life of me remember which bank) will only change travellers cheques into Egyptian, not foreign currency. This turned out to be a complete pain because our hotel, the Old Cataract, only accepts payment for bar bills etc in foreign currency. You may want to take sufficient cash with you to pay for any drinks etc you sign for (and the beers are expensive at 25LE a go). On the subject of banks, I tried to use my debit card in a hotel ATM machine at the Old Cataract Hotel. Not only was it refused, but it didn't work on my return to the U.K. (thanks HSBC) in spite of the fact that I have used it quite happily in the past. That resulted in a long and heated conversation with HSBC at London Bridge station, where I found myself in the pouring rain without enough cash to get myself home, and a flat refusal from the hole in the wall! You may want to chat to your bank before you go if you feel you might wish to use an ATM machine. If you have other mobile phone or Web access needs, you will find that your mobile phone should receive a good signal, because Vodafone's cellular network has good coverage in Egypt. Call costs are expensive, but you can purchase an Egyptian SIM before you go which might be worth investigating. Ask your travel company. Internet is not readily available at hotels, unlike the big hotels on the Red Sea coast - although an Email terminal was available at the Old Cataract. There are Internet Cafes along the Corniche that you might be able to use. I had planned on a web-free fortnight so I resisted the temptation to go and delve around in one. On the subject of hotels, the Old Cataract is very comfortable and truly beautiful in a completely over the top sort of way, the housekeeping team were great, the pool area was pristine, the terrace was a joy, and the food was lovely. However, the service was very poor (trying to get served on the terrace became something of a game) and the staff, including waiters, the receptionist and the cashier, speak only very little French and English. I found that the French was more successful than English, but both were a struggle. Normally this wouldn't bother me on holiday, but the Old Cataract positions itself as a hotel which caters to English and French speaking guests, and my Arabic is still composed of parrot-learned phrases. If you are not resident at the hotel you cannot use the famous terrace, which does seem fair to the residents. You will be allowed to use other restaurants and bars, but you will have to spend a minimum of 85LE to do so. You will be charged this even if your drinks etc do not come to that amount. The Movenpick, which used to be the Oberai, is located on its own island and is the proud possessor of the ghastly concrete tower that is the main landmark of the Aswan sky line. It is in the process of being completely overhauled. A new building is going up at one end of the island, and the existing hotel and gardens are very tatty and run down. It was almost abandoned, apart from workmen and a small group of young Japanese people. It has a nice little shopping zone, where I bought my usual bottle of sandalwood oil, and the people running it are a friendly bunch without being in any way pushy. The best thing about it are the ice cream and the views over Qubbat al-Hawwa (where the Old Kingdom rock-cut tombs are located). I look forward to seeing the place when it has been re-vamped. We didn't get to the big Isis hotel, a vast, sprawling pink affair also on its own island, but others I spoke to said that it was very comfortable but bland. We visited a number of must-see sites, which I will mention in brief. Unaccountably we never got to Elephantine Island, which is a hop, skip and a jump from the Old Cataract, and we didn't revisit the unfinished obelisk for a third time. Nor did we get to Silsila. The Coptic Cathedral is locked up at the moment, but you can go and rustle someone up and they will be delighted to open it up for you and take you round it. It is closed for the construction of the dome (under a splendid edifice of wooden scaffoling emantating from the middle of the Cathedral). This is a very modern building, with some beautiful glass, screens and icons, all commissioned from respected artists. Well worth a look, and if Manuela takes you round, you will be rewarded with a very articulate explanation. There is an excavation currently running next door to the Cathedral. We went to Philae with our guide, and the whole ticket office and embarkation point were unutterable bedlam - but all very good natured. We were there at 10.30am, so perhaps an earlier or later time would have been calmer. Philae itself was very busy, but very beautiful. It has the same magic that I remember from 10 years ago, which most Graeco-Roman temples lack. It is well worth a bit of a queue to visit it. The little shopping zone in the ticket square is one of the more approachable. You will be asked to come and look inside, but there is none of the over the top pressure that you find at many other places. The highlight for me was the visit to the Old Kingdom rock cut tombs at Qubbat al Hawa. I would encourage anyone who can cope with the long flight of steps up to the tombs to go. I was relieved that the tomb of Serenput II was open - and astonished at how fabulous it is even in real life, with the corridor of mummiform statues leading to the amazing paintings. The paintings, shown in books and on web pages, are not the huge murals that I had envisaged, but breathtakingly elegant compositions measuring about six feet square. The monastery of St Simeon involved a boat ride and a 15 minute walk (camels are available, but accidents are not covered on standard travel insurance). The only other Coptic monasteries I have visited were fully operational ones in the Eastern Desert, and this one was abandoned in the thirteenth century, but it gives you a real sense of what the monastic life was like. You also pass the official home of the bishop of the Coptic Cathedral on the way. The Nubia Museum is excellent. The ground floor has a good display of statues and a small number of mummies. One gallery on the ground floor is turned over to black and white photographs of rescue work in Nubia before Lake Nasser arrived. There are many images of relocated sites in their original locations. There others of sites undergoing excavation. Many sites were abandoned to the Lake. These photographs are fascinating and of very good quality, but many of them are heart breaking because you know that they show places now beneath the lake. The main museum display is to be found in the basement. The exhibits are clearly laid out in chronological order with information boards that explain the part of Egypt's past that you are looking at. The time span covers the prehistoric to modern periods, with a section at the end dedicated to Nubian art, craft and agricultural activities. The downsides are poor lighting and absolutely dire labelling of individual cabinets and artefacts. The museum extends into an extensive garden, with a fabricated rock art cave featuring a false cave with some genuine rock art incorporated into its walls, and numerous individual items - including stelae, bits of monuments, two obelisks and a number of other monuments. There is a guide book with a good describtion of Nubia's geological and archaeological past as well as its modern history, a museum map and some good photographs of some of the exhibits for 15LE, but if you arrive for opening time in the morning they don't keep a float so you will need the exact money. The shop also sells the usual selection of reproductions and tourist guides. The museum is open seven days a week from 0900-1300 and 1700-2100, and tickets currently cost 40LE per person. For shopping, you can hit the town or the hotels. We didn't make it to the soukh where the inhabitants of Aswan do their shopping - a shame, because this was certainly part of the plan. In other areas where tourists are specifically catered for you will need to be prepared to be pushed, shoved, grabbed and draped with items of clothing. You need to negotiate the price. There are three prices, according to Mahmoud: Stupid tourist, tourist and Egyptian. We found Mahmoud a useful source of information on what you should expect to pay for a given item. He gave us the following rough guidelines: For a Nubian cap 5LE, for a t-short 20-30LE, for a light scarf 15-20LE and for a shawl 40-50LE. The least stressful shopping areas were the area just in front of the Philae temple ticket office, the New Cataract and the Movenpick hotels. I went slightly mad at the New Cataract, where a book shop turned out to be a treasure trove - as well as current publications from the American University in Cairo, there was a good collection of unusual second hand books. I picked up some fabulous titles. Getting around Aswan can be done by boat, kalesh (horse and carriage) or taxi. We got a price of 30LE for a ride in a motor boat from the Old Cataract at one end of town, to the Movenpick at the other. A taxi from one end of Aswan to the other will cost you, one way, 15-20LE. I didn't gather what you should expect to pay for a kalesh. Be very sure to negotiate and agree prices BEFORE you get into the vehicle. If you are taking a kalesh, do look at the condition of the horse - most seemed to be in very good condition, but one was a dreadful sight. We didn't make it to Elephantine, but there is a local ferry across from the 3rd jetty along (walking north from the Coptic Cathedral) which costs 1-2LE (The Aswan Museum, on the island, costs 25LE per person and is open from 9am-3/4pm). Photography in Aswan is fairly straight forward, at the time of writing, at the sites we visited, as follows. At Philae there are no restrictions and you can even use flash. At the Nubian Museum you don't need a special ticket, and you can use a camera without flash. However, without flash not even my camera (which has a 1600ASA setting) could achieve anything more than fairly poor results. If your taste runs to wildlife, you may have the opportunity to go on a tour which encompasses Kitchener's Island and a bird watching tour by boat. Although you can certainly visit the Island on your own to walk around the lovely botanic gardens, the bird watching tour is well worth the time, because not only do you see some wonderful bird life, but you become familiar with the network of granite islands and reed beds that dot the First Cataract. This trip was a real highlight. I hope that this little lot is of some interest. I'll deposit a selection of the photographs I took on a web page. Alberto Silotti. Aswan, Egypt Pocket Guide. American University in Cairo Press. 2002. Not much info on things like opening times, but provides some useful short summaries of the the sites, a short description of Aswan and a good overview of the Nubia Museum. William J. Murnane. Penguin Guide to Ancient Egypt. Penguin. 1996. I have found this book, now tragically out of print, by far the best guide to ancient Egypt. It seems to be quite readily available from sites like Exedra and Amazon's Marketplace, but it is worth hunting around for a reasonable price. The diagrams and descriptions are excellent. Lucia Gahlin. Ancient Egypt. Hermes House. 2002. This has both good descriptions, though not as detailed as Murnane's, and good photographs. Fouad Ibrahim and Barbara Ibrahim. Egypt, An Economic Geography. I.B. Tauris. 2003. By far the best introduction I have found so far to modern Egypt. If you want to understand the pros and cons of the Aswan High Dam, look no further. Bonnie Sampsell. Travellers Guide to the Geology of Egypt. AUC. 2003. I was going to say that I never go to Egypt without this book, but I somehow managed to leave it at home. If you want to understand the topography and geomorphology of the surrounding landscape, you can do very little better than this elegant piece of work. A friend has just pointed out that I was fairly incendiary on the subject of Gatwick and GB Airways when we came back to the UK. Gatwick was chaos - a half hour wait in an unending single queue to the checkout desks, shifting forward every minute or so in 6-inch increments. There were older people in that queue who really didn't need it. Luxor airport, by ironic comparison, was a well-managed breeze at the checkout. GB Airways are the charter branch of British Airways. They were, in my opinion, unbelievably disorganized - many of the basic inflight logisitcs were sloppy. If I ever use the charter option again to get low cut flights to Egypt, I'll be hunting frantically for someone else to fly with. I wrote them a four page letter of complaint. If you do fly with them, they have the British Airways rules on baggage restrictions, as publicized recently in the media. The biggest impact of this, particularly on older people, is that you can only take one piece of luggage, even if two pieces still weigh less, combined, than the total permitted weight. It's a good idea to take your own water and wine if you want it (they had run out on the return journey - a five and a half hour flight), be prepared to eat what your given (no choice offered, even though different dishes were available - and it was pretty vile anyway), accept the fact that you may have a) no movie or b) the wrong movie (both scenarios occurred), that they will run out of blankets a few minutes into the flight, and that if you feel moved to comment on the situation, the small print in their on-board complaints form tries to lure you into signing up for promotional material from them. "El ministro egipcio de Cultura, Faruq Hosni, anunció que su país recuperará dos urnas de alabastro con forma de pato que datan del Imperio Medio (2025-1795 a.C.) y que fueron sacadas de contrabando fuera de Egipto. Las dos piezas arqueológicas, que eran usadas para contener alimentos fueron descubiertas en 1979 por el experto estadounidense Dieter Arnold en la pirámide del faraón Amenemhat III (1860-1814 a.C.), precisó el ministro en un comunicado." Rough translation: The Egyptian Minister of Cutlure, Farouk Hosni, has announced that Egypt will recover two duck-shaped alabaster vesesls dating to the Middle Kingdom, and which were smuggled out of Egypt. According to informtaion from the Minsitry, he two artefacts, which were used as food containers, were discovered in 1979 by Dieter Arnold in the pyramid of the Pharaoh Amenemhat III. "An extremely rare Tyrannosaurid skull, an ancient Egyptian mummy hand, and the largest iron ore meteorite are among the hundreds of world-class specimens in the most comprehensive natural history auction ever in New York this week. The auction is under the auspices of J.M. Chait, the preeminent Beverly Hills auction house. . . . . Egyptian Mummy Hand - The mummification indicates a possible date between the New Kingdom and the Ptolemaic period. A slideshow of the items is available below. Thanks to Thierry Benderitter for letting me know that after three months of hard work, the excellent Osirisnet website has been updated with complete details about the Saqqara mastaba of Niakhkhnum and Khnumhotep. There are five pages of descriptions, translations, diagrams and photographs - do have a look. "Mansour Boraik was introduced (extremely wittily) by one of his colleagues. He started his career as an Inspector on the Giza Plateau and was the right hand man of Zahi Hawass for many years. He found the Valley of the Workers where the pyramid builders lived. He moved from Giza to Aswan to Sohag and came to Luxor 15 months ago. He explained that when he arrived here there were many national projects going on and it was a challenge for the Inspectorate to manage all of then. At that time these were mainly on the East Bank but recently they have had the added challenge of the removal of Gurna Village on the West Bank. There is a budget of 600 million pounds for these projects. He arranged for Mark Lehner to come to Luxor and to train the Inspectors. Also Ray Johnson of Chicago House has contributed in to professional development of the Inspectorate. "Just by coincidence I happened to come across a reissuing of three novels by Naquib Mahfouz, the Nobel Prize winner for literature in 1988 who just recently died. Three Novels Of Ancient Egypt is a new release through the Everyman Library of Random House Canada containing three short pieces the author had written in the 1930's. I don't know whether or not Khufu's Wisdom, Rhadopis Of Nubia, or Thebes At War have ever been translated into English before, but this is the first time the three novels have been published together in an omnibus form. They are logical choices to be produced together of course because all three are set in different periods of the glorious days of Egypt's Pharaohs." An account of a Nile cruise with visits to Cairo, Philae and Abu Simbel. It is coming to the end of the most popular time for tourism in Egypt, but there seem to be lots of travel accounts around: "In the Aswan area, where we saw the great dam that has enabled this mostly desert country to expand its cultivable area, we toured the magnificent Philae Temple, site of an especially beautiful shrine honoring the greatest of Egyptian goddesses, Isis, the wife of Osiris, god of life and death and fertility, and the mother of Horus, who, among other things, was said to unite Egypt and had the power to confer deity on Pharaohs. Like Abu Simbel, Philae, which also includes lesser temples, tells a great rescue story. Partially submerged most of the year following the building of the first Aswan Dam in the early 1900s, it was threatened with total immersion and certain ruin 60 years later when the much higher second Aswan Dam was built." See the above for the entire two page-article . "Más de 25.000 personas han visitado la exposición ´Egipto: el viaje a la eternidad´ que el Museo Arqueológico y de Historia de Elche (MAHE) acoge desde el pasado 25 de enero y hasta el próximo domingo, 25 de marzo, según informaron en un comunicado fuentes del Ayuntamiento de Elche." Rough translation: According to information from the Elche City Council more than 25,000 people have visited the exhibition Egypt: the voyage into eternity which has been showing at the Elche Museum of Archaeology and History from January 25th to March 25th. "There exists a site in southern Egypt that is the oldest astronomical site in the world. This site, called Nabta, was created some 6500 years ago by a Neolithic people who were concerned with the progress of the year. The circle of standing stones allowed the people to determine when the solstices occurred as well as rainy seasons. This sub-Saharan culture is likely to be the predecessor of the Egyptians. The site was excavated by Fred Wendorf and John (Kim) Malville. Stones, some more then 9 feet tall, were set in a circle to predict the coming solstices. The people had to drag these monstrous stones for more than a mile, thus showing a great dedication to their task. Scientists have discovered that there is an east-west sighting among the megaliths, as well as a north-south lining." "In the early 1960's, when Egypt built the High Dam at Aswan, Egyptologists and archaeologists the world over heeded UNESCO's appeal to salvage the monuments of Egyptian Nubia before the rising waters of Lake Nasser submerged them forever. More than sixty expeditions ultimately joined the "Nubian Rescue Campaign", which resulted in the excavation and recording of hundreds of sites, the recovery of thousands of objects, and the salvage and translocation of a number of important temples to higher ground. Due to the quantities of material recovered from tombs, temples and settlements, UNESCO was encouraged in the 1980's to plan a new Nubian museum in Aswan where the objects could be stored and exhibited. It was universally felt at the time that they should be kept as close as possible to their principal places of origin. Nearly twelve years later, the Museum became a reality and opened its doors in November 1997. It was designed by the late Egyptian architect Mahmoud al-Hakim, and Mexican architect Pedro Vasquez Ramirez designed the museum's interior display. The Museum won the Agha-Khan Award of Architecture 2001. " The site's home page is at the address below, and includes links to the FlashGlyph vocabulary program, and Senet for Windows. "Since it was brought to the Spanish capital Madrid in the early 1970s, one of the most important Egyptian temples of the Western world is said to have deteriorated more than during the previous two millennia in Egypt. Concerned about its state, experts are proposing solutions, including covering it with a glass dome. Located just a step from the hustle and bustle of the Gran Via, one of Madrid's central arteries, the building known as the temple of Debod takes some 150,000 annual visitors back in time to the world of Ancient Egypt. Egypt donated the temple to thank Spain for helping to rescue it and other monuments from the rising waters of the Nile during the construction of the Aswan High Dam." See the above for more details. The Geographical website has relaunched, with a new look and some excellent new features in a number of sections. At the moment it includes twelve pictures of the Nile in a slideshow. To reach the slideshow go to the above URL, then click on Features, then Photostories. "Mark Millmore's first literary offering is fantastic! It's much more than a book, more a trip through a time that we're all broadly familiar with, but with an eye to detail that makes the reader feel they're right there, and any previous knowledge they may have had of the Land of the Pharaohs was plainly inadequate. 'Imagining Egypt' is actually a bit of a misleading title. The reader doesn't need to imagine that much because the sheer depth of information in Millmore's book is vast. But don't get me wrong, this isn't page after page of boring writing with a few line drawings thrown in for good measure. This book is a full colour journey that really does bring to life the wonders of ancient Egypt." See the above page for the reset of the review. "As I looked up at four colossal sandstone statutes of the great Egyptian King Ramses II seated upon his throne wearing his huge double crown signifying reign over both Upper and Lower Egypt, I felt the same way I felt the first time I gazed upon such wonders as the pyramids, the Great Wall of China, the Taj Mahal or the effigies of Easter Island. I had been to Egypt twice before, but only to Cairo to see the pyramids and tour the Egyptian Museum of Antiquities. Now I realize that is just not enough. To truly appreciate Egypt you have to look beyond the pyramids." "What was life like in an Egyptian oasis? The Dakhleh oasis is huge - today it is home to some 70,000 people - and the Dakhleh Oasis Project has been charting the environmental background throughout history. The sands are always shifting: they swallowed up - and sometimes revealed - Neolithic farmers, an Old Kingdom bakery, two Egyptian temples - as well as both a Roman and a Moslem town. See how the ever-fickle environment changed lives through the ages." "The April/May 2007 issue takes a closer look at the sphinx and its history. The Metropolitan Museum of Art in New York gives us a look at the photography of Harry Burton. This collection of photographs was taken during the excavation of Tutankharmun's tomb. The Brooklyn Museum's archaeological team has made a discovery in the Temple Precinct of the Goddess Mut at South Karnak." "Officials said Tuesday that more than 616,000 tickets for "Tutankhamun and the Golden Age of the Pharaohs" have been sold or reserved since they went on sale in November. . . . Museum officials said the current exhibition, which featuring treasures found in the tomb of the Egyptian boy-king, is on track to draw 1 million visitors before it closes Sept. 30." "The King Tut exhibit at the Franklin Institute is dull, dark and disappointing. But at least the lines are long. More than 600,000 people viewed Tutankhamun and the Golden Age of the Pharaohs in the show's first six weeks in Philadelphia. Rarely have so many paid so much to see an itty, bitty liver casket. That was my sucker moment. I stood there, beholding the box that once stored Tut's bile, and began to feel rather poorly myself. Thirty-two bucks per ticket, plus parking and numbingly long lines, for this? Oy, I thought. His liver. Call me a low-brow, a whiner, a Philistine. No offense taken: The original Philistines thought Pharaoh Ramesses III was tedious, too. So he smote them. Not feeling appreciative of 3,000-year-old artifacts is a bit awkward. I knew I should appreciate the boy king's possessions." "I was perched seven feet above ground. And the fear of a bruising fall made me shudder. Added to that was the terror of being stomped on by Solomon, a gangly camel that seemed to weigh almost a tonne or more. I longed for firm ground. Therefore, I refused to show any annoyance at the unreasonable demand of Ahmad, the camel handler, for 100 Egyptian pounds (Dh65) for the short ride on Solomon that lasted less than 30 paces. I had been lured by the prospect of getting all the three pyramids of Giza outside Cairo, the Egyptian capital, in one photographic frame. . . . The grandeur and richness of Egyptian culture is an experience that could not have been imagined or gleaned from school textbooks. The pyramids, integral to Egypt, stand tall as a testimony to human creativity, rising high above a desolate desert landscape. With over seven million tourists visiting the pyramids every year, the tourist guides and the camel handlers know how to make the most from each visitor. But for those who refuse to be unsettled by such minor distractions, the Cairo experience can be exhilarating." "Mummies: Secrets of the Pharaohs, brings to life ancient wonders, historic intrigue and a modern-day forensic adventure, all in one eye-popping new film opening in IMAX® and other Giant Screen Theaters in June 2007. Why are people endlessly fascinated with mummies? The worldwide curiosity about mummification is an age-old phenomenon as enduring as mummies themselves. During Egypt’s history, literally millions of mummies were made. In Mummies: Secrets of the Pharaohs, filmgoers will marvel at the sight of these human time capsules, shown in larger-than-life detail on the giant screen. Narrated by actor Christopher Lee (The Lord Of The Rings, Star Wars, and the original 1959 film The Mummy), Mummies: Secrets of the Pharaohs unravels some of the mysteries enshrouding the ancient royal mummies, how they were embalmed and where they were hidden. The film recreates the dramatic story of their recovery—an Indiana Jones-type tale of tomb-raiders and hidden treasure that led to one of the most significant archaeological finds in modern history. Featuring top researchers, such as Egyptologists Dr. Bob Brier and Dr. Zahi Hawass (head of Egypt’s antiquities) and DNA scientist Angelique Corthals, Mummies also embarks on a genetic analysis of mummies that could have huge implications for the study of modern human diseases." "As many as one million Russian tourists visited Egypt in 2006, said head of the Egyptian Tourism Authority Ahmed al-Khadem on Thursday. In statements in Moscow, al-Khadem attributed the increase in the number of Russian tourists visiting Egypt to the improvement of services offered to tourists. Al-Khadem said that Sharm el-Sheikh and Hurghada were considered a mecca for the Russian tourists, pointing out that the number of tourists who visited Egypt last year from all over the world hit 10 million." "Although the winter in Egypt is not the peak season for birdwatching, there are almost 150 Egyptian resident species that cater to year-round birdwatching. The Egyptian habitat is very diverse, ranging from amorphous mountains, vast deserts, huge wetlands along the Mediterranean coast and the luxuriance of vegetation along the Nile basin, making Egypt a birdwatching paradise not only for its variety but also for the density of bird species. So, I decided to embark on several journeys to spot our feathered friends. On a beautiful, warm winter morning, Ahmed Riad, one of Egypt's top ornithologists, decided to start our excursion by paying a visit to the desert birds." Modern granite sculpting at Aswan is an annual event. Nevine El-Aref looks at some of the contributors: "Other sculptures carry a religious theme taken from ancient Egyptian rituals and also from Buddhism. The first is an "Exclusive Dance to the Sun" by Akram El-Magdoub, which follows an ancient story about Pharaoh Ramses II of the 19th Dynasty. Magdoub is a well-known architect responsible for creating distinguished buildings in Egypt and abroad. His creativity has led him to explore all fields of art. In addition to his engineering career, El-Magdoub is a poet and a writer. One of his poems and two theatrical plays were written for the Cairo Experimental Theatre, the Basic Elements and Towards a New World. In Aswan this year he explored another art field, granite sculpture." "Giuseppe Verdi might recognize Elton John and Tim Rice's Aida — it's still a story of love, honor and courage — but it's hard imagine what the great opera composer might think of all those Elton John tunes. . . . Set in ancient times but updated with modern dialogue and comic touches, it's the classic story of a doomed romance. Radames, commander of the Egyptian army, is engaged to the Pharaoh's daughter, Amneris, but falls in love with Aida, captive daughter of the Nubian king, who was defeated in battle. Although based on Verdi's famous work, which was first performed in 1871, this is not that Aida. The songs run from reggae to Motown to gospel to pop. The score earned the original Broadway production a Tony Award in 2000 for Best Original Score." "Today it was announced through The Hollywood Reporter that Jet Li is in fact in negotiations to play the title villanious character in The Mummy 3 for Universal. The script was written by written by Alfred Gough and Miles Millar which will be directed by Rob Cohen. Currently they are remaining very tight lipped about what the film will be about. But they have released a few details. It is known that the action is set in China, with Li's story beginning in ancient times before moving to a post-World War II setting. It is also known that one sequence involves the famous terra-cotta warriors, the collection of 6,000 men and their horses that were originally constructed to protect the tomb of an emperor." I have now updated the blog with backdated news items between 4th March 2007 up to and including today, 23rd March 2007. You will need to go into the March 2007 archive to see all the older posts. I have marked the point at which they begin with a large photograph to make the starting point easy to find. Any missing items will be added later. Thanks from the bottom of my heart to Kat Newkirk and Chris Townsend for keeping me posted with all the news items which they found whilst I was away.
" Secretary General of the Supreme Council of Antiquities (SCA) Dr. Zahi Hawwas said the new discovery includes 42 clay pots and 42 flower bouquets, which had been thrown into the deceased's tomb at the end of the funeral ceremony. This ritual is featured on a wall at Djehuty's burial chamber showing the family of the deceased, along with priests holding clay pot and flower bouquets. According to Dr. Hawwas, during the cleaning of the area in front of the tomb, archaeologists hit upon the remains of a six meter long wall that once made the tomb's facade. Jose Gallan, head of the Spanish team said that during excavation works at the tomb's open court, a moderate wooden sarcophagus was found inside a small pit. It includes the bones of an unidentified woman that can be dated to the New Kingdom era." "American-Egyptologist Dr David B. O'Connor was honored, on Saturday by the Supreme Council of Antiquities in recognition of his continued dedication and contributions to the science of Egyptology. A former student of O’Connor and Head of the Supreme Council of Antiquities Zahi Hawass highlighted to an audience of Egyptology specialists and enthusiasts how his research was influenced by O'Connor, who has worked in Egypt since 1960. Hawass spoke of the impact O'Connor had on his first years in the field after having met O'Connor in Luxor at age 21." "When lightning strikes sand or soil, it melts and fuses grains into features that some have called petrified lightning bolts. Their scientific name is fulgurites, after fulgur, the Latin word for lightning. Fulgurites are branched, thin, hollow tubes usually 1 or 2 inches in diameter and a few feet to tens of feet long. They are rough on the outside (where sand grains and other material stick to the molten material) but glassy smooth on the inside, with many bubble holes produced by vaporized gases. issue of the journal Geology put fulgurites to a scientific use, to obtain 15,000-year-old climate data. About 65 lightning flashes occur per second worldwide, but lightning is not randomly distributed ? some areas get more than others. One area that sees few storms is the Libyan Desert in southwestern Egypt." "Archaeology teams in Sudan are working against the clock to rescue an entire swathe of Nile Valley heritage from the rising waters of a Chinese-built dam. The Merowe dam is a controversial hydro-electric project - one of the largest in Africa - being erected on the Nile's fourth cataract and due to start flooding the valley over more than 100 miles (160 kilometres) within months. 'The paradox is that, yes, an entire area is being wiped off the map but thanks to the rescue project, Sudanese archaeology is being put on the map,' Sudan's antiquities chief Salah Ahmed told AFP yesterday. Archaeologists admit that an incalculable amount of information will be forever lost. But the largest archaeological rescue project since the Nubian campaign launched in the 1960s during the construction of the Aswan Dam in southern Egypt has unearthed heritage that would likely have remained untapped. 'This area was completely unknown to archaeologists, it was a missing chapter in Sudan's history and nobody was planning to go there because it's very hard from a logistical point of view,' Ahmed said.Teams of archaeologists from Britain, France, Germany, Poland and a dozen other countries have been relentlessly searching the fertile Nile River banks near Merowe for at least five years now and made some significant discoveries.Some of the artifacts found in the flooded area enabled archaeologists to redefine the borders of ancient kingdoms, such as Kerma which ruled part of Nubia between 2,500 and 1,500 BC. 'We found very rich Kerma occupation farther upstream, extending the frontiers of this important kingdom by more than 200 kilometres (120 miles)," Ahmed said. "We also found for the first time in the fourth cataract area the foundations of a pyramid, with Meroitic ceramics. This gives political importance to the area because it shows someone important was buried there.' "
This is the complete item on the Egyptian Gazette website. "The exhibition on the museum's ground floor falls within a series organised by the Egyptian Museum to highlight some of the treasures of its collection which has been hidden for decades in its overflowing vaults. The display changes every six months. The current exhibition, Anubis, Upwawet and other Deities, displays 1,000 year's worth of offerings to the ancient Egyptian jackal deity Anubis, god of mummification, and Upwawet, who opened the passage allowing the soul of the deceased to cross to the afterlife. These two were the principle protective deities of the Upper Egyptian city of Assiut from the 18th to the 21st dynasties. The 58 themed objects show new aspects of the social life, regular traditions and popular religion in Middle Egypt during the New Kingdom and later. It includes terracotta, sandstone and limestone statues featuring Anubis in various positions and processions. Stelae reveal the titles and professions of people who lived in Assiut, and show how they practised their religion with an enthusiasm and individuality far removed from the solemnity of official temples and chapels. It also illustrates the difference and elaborate relationship between both deities, which were held to be of great importance by the ancient Egyptians." See the above page for details. The Al Ahram website is painfully slow this morning, but pages do load eventually. "The final seven will be chosen from a shortlist of 21 nominated sites across the planet. Yet, even though the Giza Pyramids have maintained their place through the ages, the idea of a new list has fallen flat here in Egypt where the Antiquities Authorities are bent on opposing the concept of a popular vote. When the poll was launched in 2001, 77 candidates were nominated, all of them meeting the criteria that they were built before 2000, and were still standing. Telephone and Internet votes have so far whittled this number down to 21. These are, in no particular order, the Taj Mahal; Stonehenge; the Athens Acropolis; the Great Wall of China; the Giza Pyramids; the Statue of Liberty; the Eiffel Tower; Peru's Machu Picchu; Istanbul's Haghia Sophia; the Kremlin and St Basil's Cathedral in Moscow; the Colosseum; Germany's Neuschwanstein Castle; Spain's Alhambra; Japan's Kiyomizu Temple; the Sydney Opera House; Cambodia's Angkor; Timbuktu; Petra; Brazil's Statue of Christ Redeemer; Easter Island; and Chichen Itza, Mexico." "Brazilian Egyptologist Cláudio Prado de Mello is building the first National Egyptology Institute in Brazil. It will operate in a building, in Rio de Janeiro, that is inspired on an Egyptian construction of the Mamluk dynasty, which ruled Egypt between 1235 and 1517 AD. . . . In 1990 a group of Brazilian historians and archaeologists decided to establish the institute in Rio de Janeiro. According to Mello, the organization was established focussing on the Islamic world, but the visitors are also going to have access to other cultures. The Egyptian complex, which has three storeys, is going to house around 15 rooms where over 900 items will be exhibited and a library with 25,000 titles. Eleven rooms will house permanent exhibits, covering the formation of the earth; the first civilizations; classic cultures, like the Greek and Roman; the Byzantine culture and the Islamic world; Pre-Columbian cultures, like the Incas, Aztecs and Mayas; South American baroque art; culture of the Far East; Medieval, Renaissance and primitive Art." 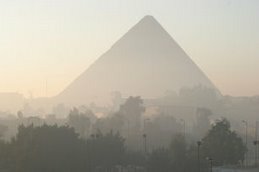 "As we leave the airport, weary with jet lag, Egypt begins to weave its magic. Elaborate mosques and sprawling government buildings compete for space alongside housing block ruins. Laundry, surprisingly bright in colour despite the heavy pollution, billows in the wind. It hangs outside many a run-down apartment window to dry in the warm Cairo breeze. Egypt's beauty lies in its startling contradictions. The bustling cities and the desert lands. It's there on the streets - donkeys trot down the main roads pulling heavy carts weighed down with people and produce." Accompanied by six rather nice photographs. See the above page for more. "This year, imparting wisdom to eager rows of biology students is not on the timetable for Distinguished Professor David Lambert. Instead, this eminent researcher will be immersed in a very quiet, but compelling interaction with mummified Sacred Ibis from deep in the catacombs of Egypt. This month Professor Lambert embarks on a new phase of the ancient DNA research for which he has been awarded a James Cook Research Fellowship by the Royal Society of New Zealand. It’s the research that has earned his group at the Allan Wilson Centre, world wide accolades for its contribution to evolution studies and molecular ecology. Having a source of well preserved remains thousands of years old and from other times in distant history has been a key contributor to advancing this research." "Approximately two years ago, American archaeologist Semir Osmanagich and his team made the astounding discovery of a series of pyramids in Bosnia. Last Sunday, speaking at the Supreme Council of Culture, Bosnian-born Osmanagich called on Egyptian archaeologists and geologists to assist in excavating the pyramids and uncovering whether the pyramids are a product of man or nature. . . .
Osmanagich believes that the Egyptians with their long experience in the excavations of monuments, particularly of the Giza Pyramids, would be best-suited for the job. Likewise, the Egyptians are eager to go and assess Osmanagich's discovery first hand. It is a good opportunity to cooperate with the experts of Bosnia in a new field like archaeology, said Anwar Ibrahim, first Undersecretary of the Ministry of Culture. Carrying a book by Osmanagich on the Bosnian pyramids in hand, he told The Daily Star Egypt that he would ask for permission to translate it into Arabic." "Of all the times in ancient Egypt’s long history, the Amarna Period (circa 1353 to 1336 BCE) is one of the most intriguing. In little more than a generation, the religious, artistic, and political order of Egyptian civilization was radically altered—and then restored. Egyptologists continue to make important discoveries about this time—and to debate their meaning. On Saturday, March 31, the University of Pennsylvania Museum of Archaeology and Anthropology hosts a gathering of prominent Egyptologists from two continents, offering a variety of perspectives on this revolutionary period. “Amarna: New Research and Discoveries in the Age of Akhenaten and Tutankhamun,” a full day public symposium, is co-sponsored by Archaeology Magazine and the Center for Ancient Studies at the University of Pennsylvania." A meeting special meeting was held at the Dome in Greenwich on Monday 12th March to the forthcoming “Tutankhamun and the Golden Age of the Pharaohs” exhibition. The exhibition will be at the Dome and will open on 15th November 2007 and run until 30th August 2008. At a packed meeting, senior executives from National Geographic, AEG Exhibitions and Arts and Exhibitions International welcomed everyone present and gave an insight into the extensive exhibition which will bring to London fifty objects from the Tomb of Tutankhamun (a few of which were included in the 1972 exhibition) plus a further seventy or so objects from other Valley of the Kings tombs and sites in Egypt. Also present at the meeting was the Egyptian Ambassador to the UK, Gehad Refaat Maadi, And Dr. Zahi Hawass, Secretary General of the Egyptian Supreme Council of Antiquities. There has been a little negative reporting in some newspapers about the exhibition, especially concerning the fact that this time the gold mask is not included. Dr Hawass explained that the mask is too fragile to move, but also emphasised that the new exhibition is much better and wider in its scope than the 1972 exhibition, when fifty objects from Tutankhamun’s tomb were exhibited at the British museum. This time, with the inclusion of many more objects connected with members of Tutankhamun’s family, it will put Tutankhamun and his treasures in their historical and artistic context. The 1972 exhibition was attended by 1.7 million visitors and the organisers hope that at least 2 million people will se it this time. As at 12th March 135,000 advance group tickets have already been sold. One special extra for the London exhibition will be an additional dedicated gallery to Howard Carter and Lord Carnarvon. The Dome (now known as The O2 ) having been unused since 2001, has undergone a massive transformation on the inside, due to be completed (on budget and ahead of schedule the organisers were keen to point out) in June. The entertainment complex will include a concert arena, cinemas, restaurants and leisure facilities as well as the new exhibition centre. The Tutankhamun exhibition will be the first to be held there. For more information on the exhibition, please visit www.visitlondon.com/tut or http://www.kingtut.org/. "Fifty Egyptian treasures from the tomb of Tutankhamun will be shown in the UK. It is the first time in 35 years that the artefacts, which were excavated from the boy king's tomb in the burial chamber, will be on display in London. More than 130 treasures from the Valley of the Kings, which are all between 3,000 and 3,500 years old, will also make up the exhibition. The treasures will be displayed on 15 November at the venue now called the O2, formerly the Millennium Dome. Among the artefacts included in the Tutankhamun and the Golden Age of the Pharaohs exhibition will be his gold crown and one of the gold and inlaid canopic coffinettes which contained Tutankhamun's mummified internal organs." "Treasures from the tomb of the Egyptian pharaoh Tutankhamun are to return to the country for the first time in 35 years. His golden royal crown will be among more than 130 exhibits at the O2 centre, the former Millennium Dome, in November. But the famous golden funerary mask which so impressed the public at the last such exhibition in London in 1972 is now too delicate to travel and will not be part of the display." "The O2, formerly the Millennium Dome, will attempt to prove its capability as an exhibition venue with a much-trumpeted show on boy king Tutankhamun later this year. The exhibition is to be designed by Mark Lach, senior vice-president of entertainment and exhibitions group Arts and Exhibitions International.Tutankhamun and the Golden Age of the Pharaohs, the first exhibition to take place at The O2, aims to draw visitors back in time with 'inventive design and innovative technology', featuring National Geographic images and film footage about the golden age of the pharaohs." "The big Tutankhamun show which will launch the new exhibition centre at the Dome - or the O2 Centre as it is now known - has been struck by controversy before it has even opened. The Pharaoh's gold death mask - the centrepiece of the original Tutankhamun exhibition in Britain in 1972 and the artefact which everyone remembers - will not be part of the exhibition, prompting almost inevitable disappointment for the thousands of visitors who are expected to see the show. The exhibition has already toured the US and sparked anger online with message boards complaining bitterly of feeling 'cheated' and 'deceived'. Promotional images appear to show the funerary mask - but are in fact close-ups of a miniature coffin used to store the king's liver."